On November 8, 2011, Vice President Xi Jinping met at the Great Hall of the People with Lord Charles Powell, Chairman of the British government's Asia Task Force and Director of Jardine Matheson Group, and his party. Vice President Xi welcomed Lord Powell and spoke highly of his contribution to the promotion of the China-UK economic and trade relations. Mr. Xi said that with the joint efforts of both countries, the bilateral practical cooperation in various fields has been moving forward and the bilateral relations have maintained sound development momentum. Vice President Xi pointed out that this year marks the first year of the Twelfth Five Year Plan period. In the next five years, the Chinese government will further deepen reform and opening up, speed up the transformation of economic development mode, actively expand domestic and external demands, improve the quality and efficiency of the utilization of foreign investment and support the Chinese enterprises in going global and fully participating in international cooperation. Next year will mark the 40th anniversary of the establishment of the diplomatic relations between China and the UK, which coincides with the London Olympic Games. This brings new opportunities to the bilateral relations. Mr. Xi hoped that the two sides would continue to view the bilateral relations from a strategic and long-term perspective, deepen the cooperation in various fields by enhancing communication and mutual trust in the spirit of mutual respect, mutual benefit and win-win result, conduct close communication and coordination in international affairs and properly handle their differences to promote the steady development of the relations between the two countries. 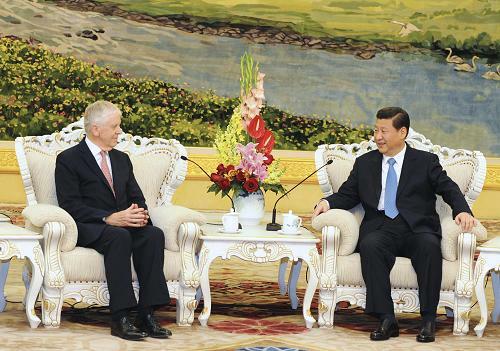 Lord Powell said that it is in the interest of both sides to strengthen the cooperation between the UK and China. The British Government pays attention to the bilateral relations and is ready to expand the cooperation between the two countries in various fields. He believed that China will continue to make new achievements. Mr. Wan Jifei, Chairman of China Council for the Promotion of International Trade, Madame Fu Ying, Vice Minister of Foreign Affairs and Mr. Zhong Shan, Vice Minister of Commerce, were also presented at the meeting.